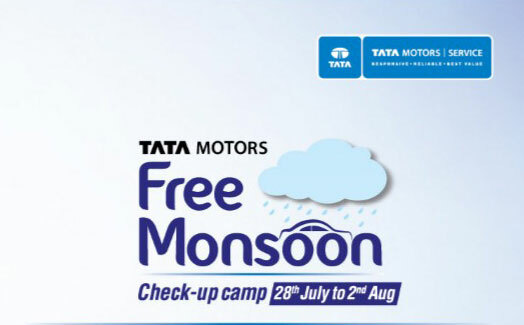 Tata Motors made an announcement today that it is rolling out nationwide Free Monsoon Check-Up camp for its passenger vehicle customers. The free check-up camp would be held from 28th July to 2nd of August, 2015, across 585 workshops in 293 cities and would cater to all Tata Motors’ passenger car as well as utility vehicle owners. Tata Motors Customers could avail free car check-up and exciting discounts of up to 20% on Tata Motors Original Parts and Labour charges. Taking forward the initiative of providing better customer Service, Tata Motors has associated with 25 different suppliers who would offer a discount of up to 10% on accessories, lubricants and other value added services. Further to the success of the first Mega Service Camp, we are very pleased to announce the roll out of the second phase. We believe that after-market services are imperative to enhance customer experience. This service camp is specially targeted to help our customers overcome issues that are resultant of the monsoons. Sales and Service from Tata Motors is evolving and adopting a customer centric approach, creating new benchmarks and identity for the company. With the success of the first phase, this monsoon camp also comes with more and better benefits planned on tyres and batteries, apart from labour, lubes, parts, safe monsoon driving tips etc. The Company will also help customers with important information which will help them to prevent their cars from being affected by the monsoon. These will be accompanied by other offers such as Free Top Wash, Vehicle Check-up, upto INR 1000 off on battery replacement (inclusive of buy back) and special offers on roadside assistance policy. At select workshops, customers can test drive the cars from Tata Motors’ stable – the stylish compact sedan – Zest and the sporty hatchback – Bolt. Furthermore, all deserving cars and UVs coming to the workshops will be evaluated and their current car valuation will be provided. A good exchange bonus will also be offered to the prospective customers. Additionally, quick/on-spot loan approvals will also be provided to the customers, on special rates of interest, on case-to-case basis.